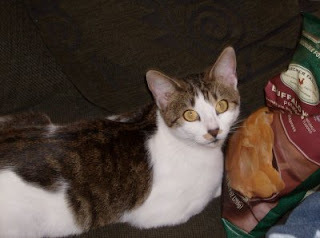 Give it up today for the cat who owns author MJ Fredrick, Mama Kitty! Sounds like she’s got a lot to deal with, what with several other cats, a DAWG, small humans and MJ’s obsession with “that writing thing” to deal with. 1) So, your human writes books. Does this mean he or she is home all day and easy to access? Elaborate if necessary. Sadly, she is not easily accessible during the day. She leaves while I am sleeping on the couch and returns home when I am sleeping on the kitchen counter (oops). She returns smelling of children, and I want nothing to do with that, until she showers. Then she curls up on my couch with her screen and completely ignores me, other than a few cursory pats. You’d think she’d miss me while she is gone. After all, she is the one who dragged me home with her from that children factory last year. 2) How large a proportion of her income do you have her devote to your gourmet tuna, cat beds, toys and other basic necessities? Hmph. Since I have to share my space with four OTHER cats and a DOG, of all things, I’m lucky to get a can of wet food every other day. Since she won’t buy me a bed or toys, I’ve shown her. I sleep on her green couch and shed my white hair, and I steal her pens and paper clips and play with them outside her bedroom door in the middle of the night. 3) What are your techniques for distracting your human during crucial writing moments, just because it’s fun? Oh, I have quite a number. I yowl at the other cats JUST when her fingers are typing fastest, usually late at night. I hack up the grass I ate outside. Some days, if I’m feeling kind, I nudge my head under her elbow until I can stretch across her belly, right next to her computer. Then I dig my claws into her skin. 4) What indignities and neglect have you suffered because of your human’s writing career? She LEAVES US locked in the house for a week every summer and sends her baby brother (NOT a cat person) to check on us. Then she returns home with books that she stacks all over my favorite napping spots. After a few days of extra-long naps, she is more enamored than ever of her computer. Even my barfs don’t distract her. 5) Tell me about the felines in your human’s fiction. How often do they appear and how big a part do they play? She. Wrote. A. Dog. As far as I know, that’s the only pet she’s written. I think she did write about cheetahs once, but that story sucked. Was before my time, though. 6) On the off-chance your human has yet to incorporate cats into a story, what are your plans for making sure she rectifies this egregious error and demonstration of poor writing skills? I do my best to inspire her about how regal and sublime a cat can be. Why she chooses to ignore my experience, I have no idea. 7) What works of fiction or cinema involving cats does your human enjoy sharing with you? Not one. She justifies it by telling me that action adventure movies don’t have a place for cats, but I see that as speciest. Why can we not have adventures just as much as those idiot dogs from Beverly Hills Chihuaha? 8) If you could make one change to your human, what would it be? She would have more hands. Question for pets: Are you happy with your human? If you could tell your human one thing, what would it be? I am mostly content. The house is large enough that my litter box is separate from the other cats. The many windows mean I do not need to share sunlight with the others. The house is suitably warm in the winter and cool in the summer, and she mostly knows when I need food and water. If I could tell her one thing? Get rid of the orange cat. Sadly, he seems to be her baby. What things does your human do that would mortify it if known? What does your human do that most annoys? Would mortify? Bwahaha! Every morning she has the exact same breakfast that she’s had for years and years (according to the other cats, when they deign to speak to me). And it’s not a healthy breakfast, either. It includes a Diet Coke. And her worst annoyance? Rising at 4 AM. Does she not know that it is my duty to wake her from a sound sleep? How can I do that when she wakes before I do?